The Beaver Public Swimming Pool offers a sliding board and spraying fountain, concession stand, changing rooms and a separate baby pool area. Additionally, the Beaver Area School District offers evening swimming opportunities to residents at its nearby indoor pool facility. The large picnic shelter offers outdoor grilling facilities, two beach sand volleyball courts, and five tennis courts. 2017 Pool Prices. For hours call 724-773-6707. With nearly 5% of the Town acreage dedicated to public park use and open space, outdoor recreation is within a few blocks from nearly everywhere in the Borough. 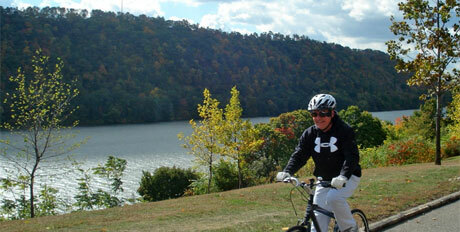 One of the Town’s outstanding features is the 1.3-mile riverside park overlooking the Ohio River. The park stretches the length of the Borough and is a popular regional gathering place for runners, walkers, bikers and rollerbladers. The linear park’s panoramic backdrop of the pristine undeveloped hillsides across the Ohio River is matchless in this part of western PA.
New skateboard park is wildly popular with bladers and boarders. 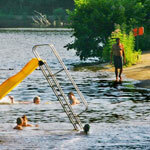 Swimming is among the many recreation opportunities at Brady’s Run Park. The Bobcat Players present year-round, live, community-based theater productions.